Isaiah Quintabe (IQ) has poor social skills but a great mind. When his brother is killed he finds himself adrift not knowing what to do. Trying to make it on his own Isaiah meets Dodson and the two form a fragile friendship. It isn't until tragedy strikes that Isaiah decides he needs to find another path. He sort of falls into being an investigator, helping people in the neighborhood, mostly for whatever they can afford but sometimes he takes on special clients who can pay well so he can pay his rent. Chapters alternate between the past and the present you see how Dodson and Isaiah meet, and the twists and turns their lives take. Isaiah helps out a local rapper for a big payoff so he can afford to help a young orphan boy with a traumatic brain injury. The case proves to be more difficult that expected and soon the killer that was after the rapper is targeting IQ. Characters come to life in this great urban mystery. Dodson and IQ make a comical team each with their own strengths. The capers they find themselves in swing from ridiculous to scary but they have each others backs even if they pretend not to like each other. 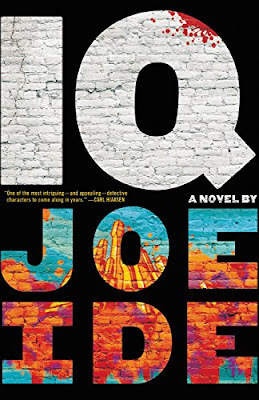 This is a great debut and I hope I see more from Ides and IQ.